Choosing the proper Metal Roof Panel (MRP) for your building is one of the first steps to achieving energy efficiency. DUOMIT install aesthetically pleasing, energy efficient, cost-effective insulated metal roofing panels for this very purpose. Insulated metal panels provide high levels of insulation for metal roofs. Also Thermal (R-value) performance and airtightness throughout the service life of the building. Contributing to achieving net-zero energy building targets and LEED® project certification. Insulated Metal Panels can reduce on-site roofing installation time by 50%. Minimizing labor costs compared to traditional multi-part roof panels. And is suitable for new and retrofit applications across commercial, industrial and cold storage market sectors. These mechanically seamed roof panels are an ideal solution where energy-efficient standing seam roof panels are required. The unique design of the panels allows interior and exterior faces (single skins), saving money and weight on a building. High R-Value. 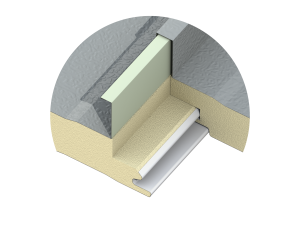 Insulated panel systems provide levels of thermal (R-value) and airtightness performance over the service life of the building. And provide the best thermal envelope by reducing thermal bridging typical of metal standing seam roof. Tested & Approved. All metal roof insulation panels have been extensively tested for compliance with various industry standards and building safety codes. Energy Efficiency. Metal panels have a core of continuous, rigid insulation for industry-leading R- and U- values with superior airtightness performance. Indoor Environmental Quality. Insulated metal roof panels help ensure a stable interior environment. Eased Construction. The insulated MRP is simple in detail and attachment, reducing schedules and installation errors. Life-Cycled Benefits. Metal roof insulation panels last as long as the service life of a typical commercial building. The durable metal roof panels also reduce operational costs for energy maintenance and offer multiple end-of-life reuse options. Building Certification and Green Targets. The insulated Roof Siding contributes to LEED certification programs and the path to Net-Zero Energy. MRP panel including Insulated Metal Wall Panel has an exceptional fire resistance, concealed fastened side joint. Includes all building codes.